National Geographic has called Corcovado ’the most biologically intense place on Earth in terms of biodiversity’. The journey to get there and the hike through the jungle itself was challenging, but the entire experience was an incredible opportunity to see wildlife and trek through such a wild and pristine jungle. Having studied Biology in college, Costa Rica was always a dream destination for me. 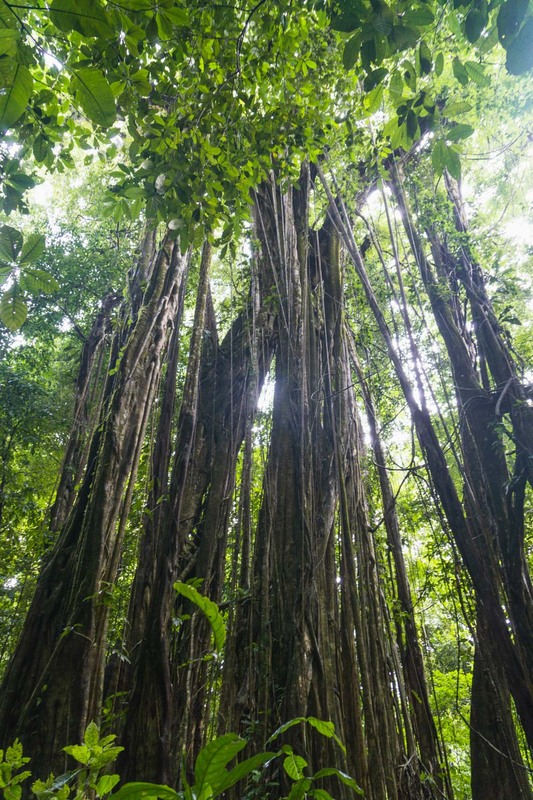 Being the largest park in Costa Rica, Corcovado is one of the few remaining lowland tropical forests in the world and contains 3.5% of the world’s biodiversity! 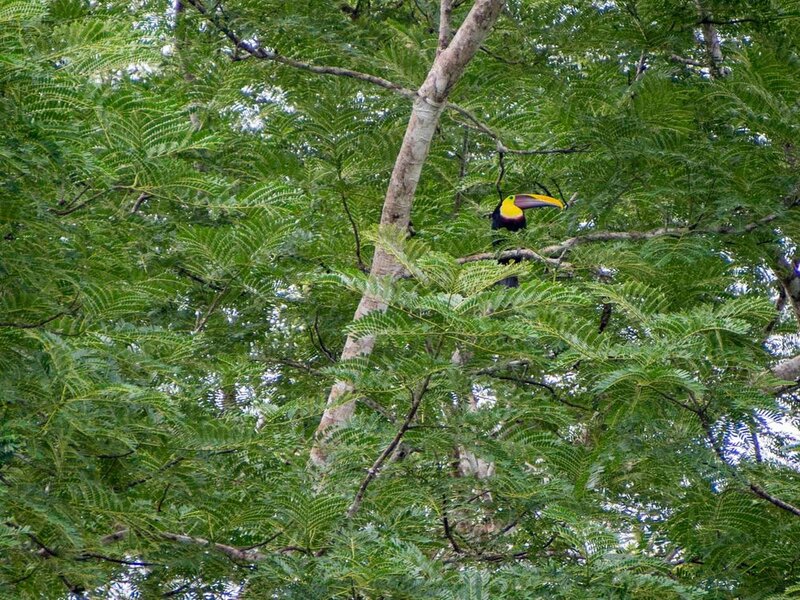 Visiting Corcovado is no straight forward task, and the information out there can be hard to find, so here are some tips I've gathered from our trip to help you plan a trek of your own. Visitors typically stay in either Drakes Bay or Puerto Jimenez. We opted for Puerto Jimenez because it’s the biggest town on the Osa Peninsula, and as we would be spending an entire week, the larger town would have more options for activities outside of Corcovado. Puerto Jimenez was also the home base for most of the Corcovado tour packages that we saw. Drake Bay seems like a town that is growing and becoming more popular, and we were drawn to staying here because all the scuba dive tours to the nearby Caño Island operate out of Drake Bay. Since we made the decision not to scuba dive this trip, we opted for the more established Puerto Jimenez. Be sure to stay in town at Puerto Jimenez if you don’t have your own car, as there are several more economical options outside of town and taxis can get expensive going back and forth. Getting to Osa is probably the hardest part. Due to the remoteness and road conditions, planning transportation can be a little tricky, but I assure you the extra effort is worth it! Since we were visiting in May, which is the start of the rainy season in Costa Rica, we weren’t sure how road conditions would be. We thought about driving from San Jose, but if driving to Drake’s Bay, there is a river crossing that can be impassable if it has been raining, and with our tight schedule, we didn’t want to take any chances having to wait for conditions to improve. However, the drive down to Puerto Jimenez is entirely on an established, paved road and can be made anytime of year. However, that drive would have taken 8-10 hours, and we weren’t sure we wanted to take away two full days from our week just to travel more. If you don’t want to drive yoruself, you can also take a bus (colectivo). Another option to getting to Drake’s Bay without having to drive is to take the ferry from Sierpe, which is about a three hour 45 minute drive from San Jose. 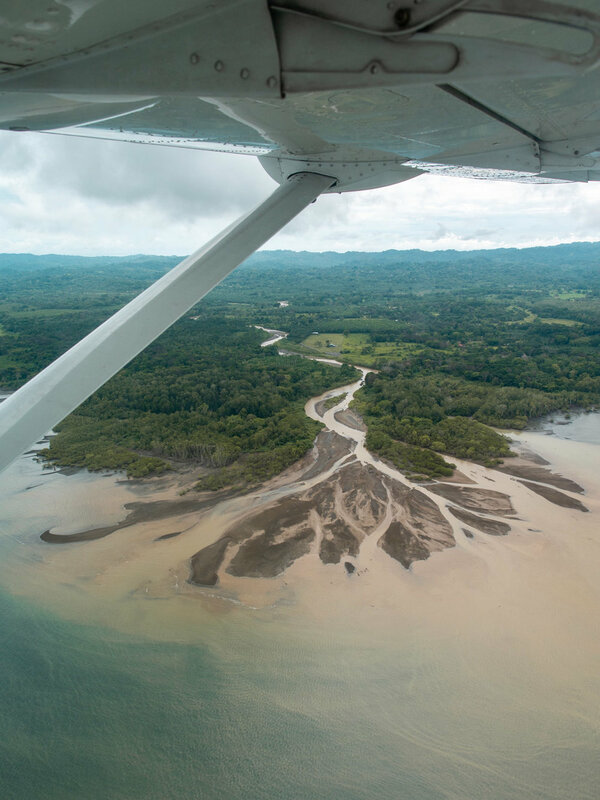 We ended up booking a round trip flight on Sansa Airlines to Puerto Jimenez, which actually worked out since the flight doubled as an aerial tour of Costa Rican landscape as we flew over the coast and several parks on the way. Nature Air is Costa Rica’s other domestic airline but had recently shut down due to safety issues. From San Jose airport, one way flights to Puerto Jimenez ranged from $80-$120, and all 12 seats tend to fill up so book early! With all the different tour companies, packages, transportation options, and entry points, we found it difficult to pick what specific tour we wanted to do. 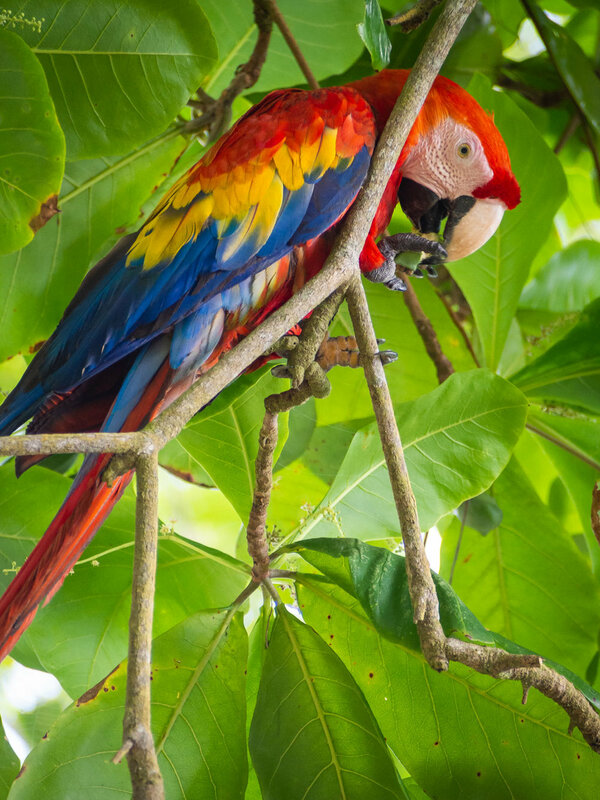 Since we had only decided on Corcovado National Park the week before and were planning our trip last minute, we emailed Osa Wild and Surcos Tours, the two most popular tour operators in Corcovado. Osa Wild ended up answering first, and we really liked the Two Night Intense Jungle Trek option that they offered, so we ended up going with them. Looking back, we were glad we picked the longer option as we covered more area, got to hike through some of the densest parts of the jungle, and ultimately we had more time on the trail to increase our animal encounter rate. We also never had to walk the same trail twice like most of the day trip options! Most visitors opt for a day trip, hiking in from Carate to La Sirena and then turning around to head back the same way. This seems really short to me, as most of our animal encounters were not on this stretch of the hike. 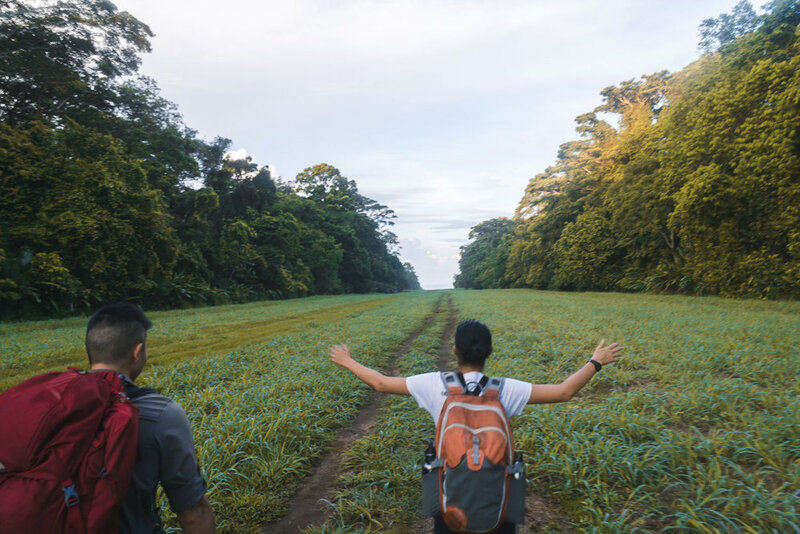 In my opinion, if you're traveling all the way to one of the most biodiverse places on earth, why not stay a little longer to experience the heart of the jungle? Many tour companies will send you a list of what to pack before your trip. Here is my combined list of what they recommended as well as additional items that you should consider packing to make sure you have all the essentials for your trip! Bug spray - Bugs are no joke in the jungle. You'll want to opt for some heavy duty DEET if you're especially prone to getting bitten. Some people have also mentioned that AVON Skin So Soft Oil has helped them keep away bugs that aren't deterred by DEET. I also treated all my hiking clothes with Permethrin before the trip. Sunscreen - This is mainly for the beach portion. Be sure to get some waterproof sunscreen because we found ourselves very sweaty. Headlamp + extra batteries - You'll want a bright light for the night hike, as well as some batteries to last two nights. Both La Tarde and La Sirena turn off their lights around 7PM, so you'll need your own source of light to get around the stations. Dry bags or ziplocks for any deep river crossings - Ziplocks work well, but I'd recommend dry bags to be extra safe. We didn't have any river crossings deeper than hip level, but if it rains the night before, you can find yourself swimming across some of the rivers. My personal favorite brand of dry bags are Sea to Summit, and I'd recommend also double bagging electronics with at least a ziplock bag. Large ziplocks or trash bags for wet clothes/shoes - You will eventually be lugging around wet clothes since nothing fully dries in the humidity of the jungle. It's nice to keep these separate from everything else. Sandals for nighttime - Nothing feels as good as kicking off those wet boots and letting those toes breath! My favorite are a closed-toe sandal like the Keen Whispers. A medium size backpack - I think our normal 55L backpacking backpacks were overkill, and I would have loved having just a 30L to go more lightweight. Telephoto lens - I often found my 16-70mm (24-105mm full frame equivalent) lens didn’t have enough zoom to get the shots I wanted. Earplugs/eyemask - Crucial for me to get a good nights sleep in a dorm setting. All the Corcovado guides have a similar set up, and I wish I had known beforehand what the most ideal clothing and shoes for a multi-day trek were. They all had jungle boots, long socks they could roll up or down depending on whether they wanted more protection or more ventilation, lose pants that can zip to shorts, and a light colored dry-fit shirt that dries quickly. They also all traveled very lightly with smaller backpacks and binoculars. 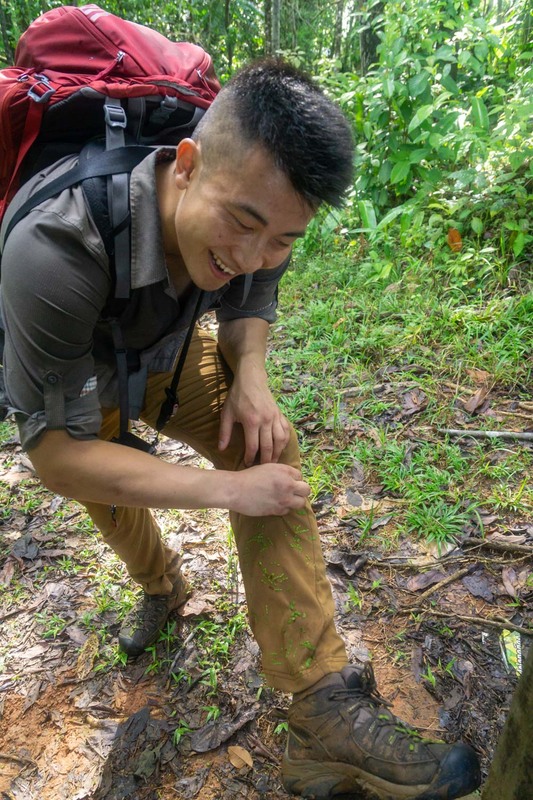 The rubber jungle boots came in handy for all of the river and stream crossings. Arlet, our guide, would walk right through the water without having to take off her boots, as long as the water level stayed below her shins. We initially tried to keep our boots dry and kept taking them on and off for crossings, but towards the end we just said ‘screw it’ and plowed through the stream. Our boots never fully dried, but everything was wet all the time anyways! Try to stay away from Goretex boots, as they don't dry well once they get wet inside. Whether you pick shoes or boots, they should have good tread that dry well. 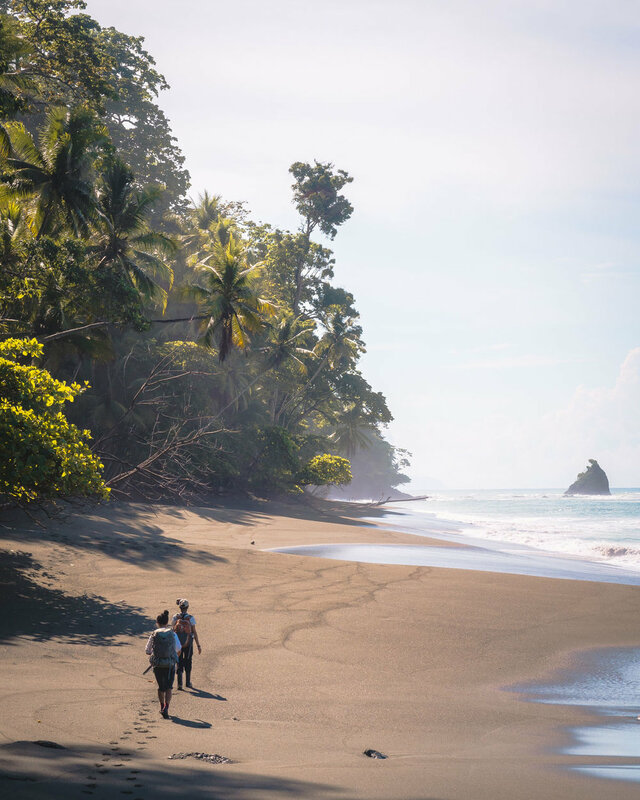 We knew a trip to Corcovado would not be cheap, especially because of its remoteness and recent requirements of having all hikers (day hikers and overnight hikers) be accompanied by a guide at all times. The tour is at a base cost of $360, which includes park entrance fees, two nights accommodations, and the first dinner, breakfast, and lunch. After adding transportation to and from the start and end points, dinner at La Sirena, and international transaction fees, the final costs came out to $434 per person in total. For food on the final day, we had brought some Lara bars from the US, but you can also go to the large BM Supermercado in Puerto Jimenez before you leave for some snacks and packable food there. The first day of the trip, Osa Wild picked us up in town in Puerto Jimenez and drove us to Ecoturístico La Tarde, a lovely eco-lodge on the edge of Corcovado up on the hillside. When we arrived around 3pm, we did a short day hike on one of the trails near the lodge and got to see frogs, howler monkeys, lizards, leaf cutter ants, and a beautiful ficus tree grove. This was our first time hiking in humid jungle conditions, and we all needed a shower after we got back. *Top left to right: A massive strangler fig tree, vultures drying their wings after the rain, a chestnut-mandibled toucan sitting in a tree. 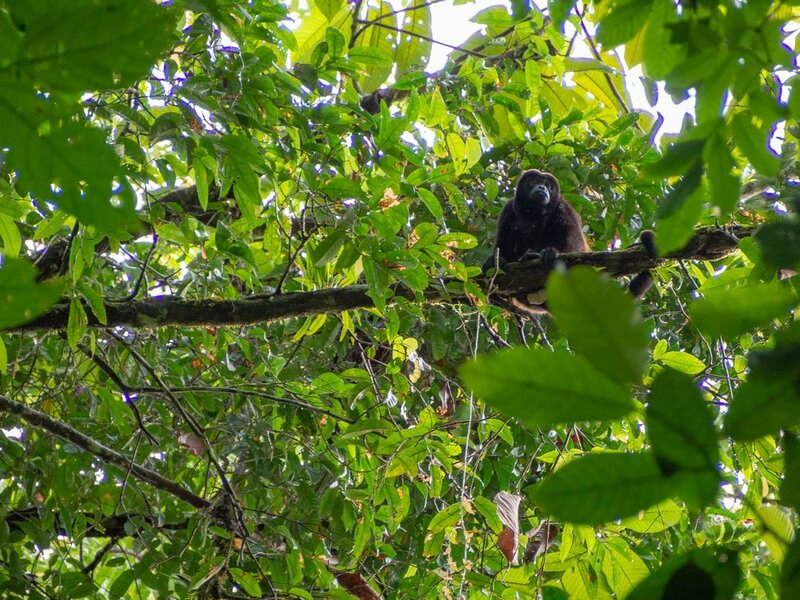 Bottom left to right: one of several howler monkeys in a tree above us, doing a short day hike in the forest around La Tarde, a poisonous eyelash pit viper. After dinner, we headed out on our night hike. 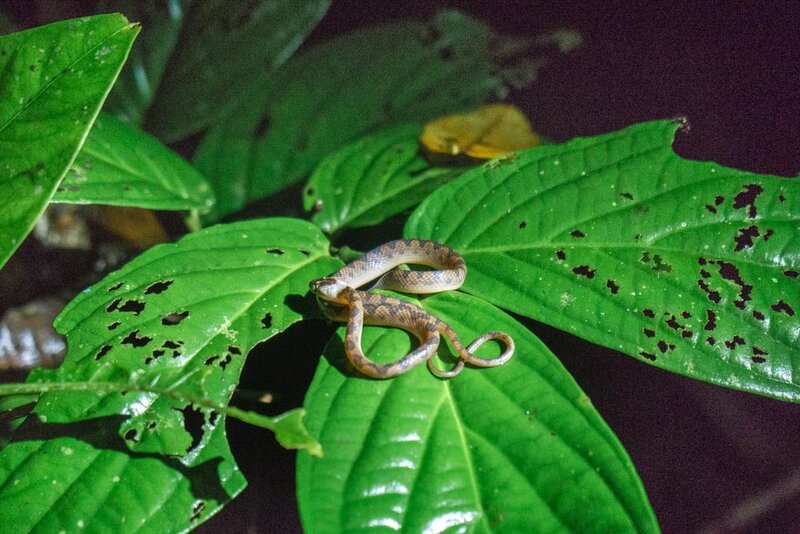 The idea of wandering through the forest at night kind of made me nervous, but the experience was quite the eye opener, as we got to see a whole different side of the jungle I never even knew existed. 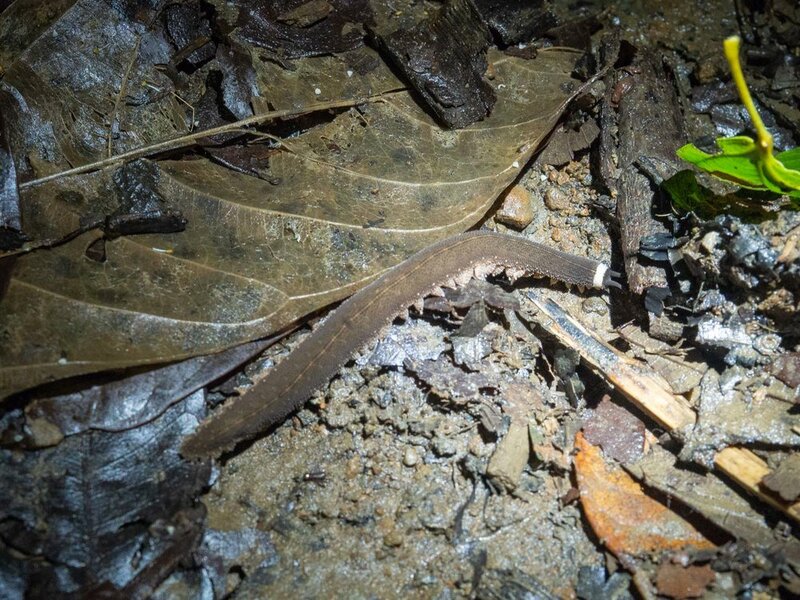 Arlet, our guide from Osa Wild was incredible at spotting camouflaged animals and tiny insects on the jungle floor. She took us on a similar path as the day hike earlier, but the jungle had quite a different feel this time around. During the entire hike, we saw so many insects, spiders, nocturnal frogs, and even some snakes. Once we got back to the lodge, we headed straight to bed to prepare to wake up early the next morning. 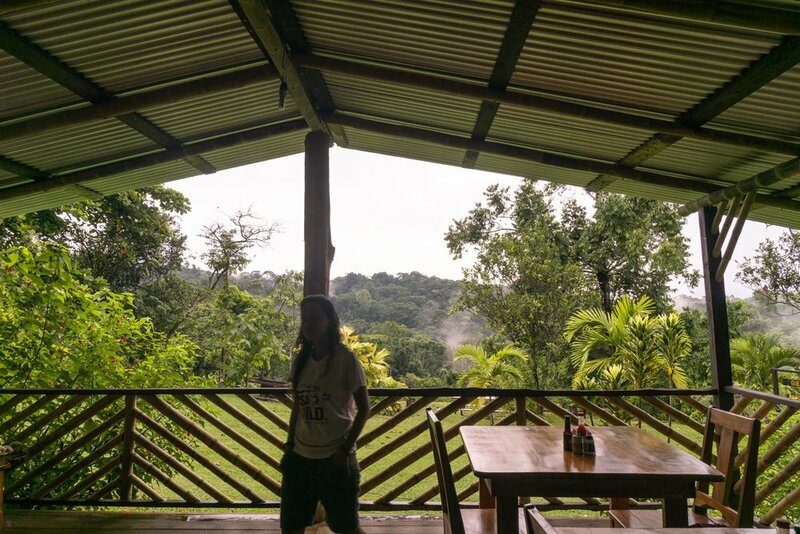 I absolutely loved staying at La Tarde, as the views of the jungle below you are spectacular, and you can start to get a feel of all of the wildlife surrounding you. Just from hanging around the lawn we spotted parakeets, hummingbirds, toucans, and scarlet macaws in the nearby trees. The lodge is an all-inclusive experience, and the food and packed lunch were both delicious and filling. Our tent cabin was one of the newer ones, complete with a jungle-view balcony and outdoor toilet and cold outdoor shower! La Tarde provided towels and hand soap, but be sure to bring everything else. There is even very slow wifi connection if needed. It wasn’t that hard to wake up at 5:30am, since the jungle explodes in a cacophony of sounds before the sunrise. The air felt deliciously cool as we started on our long trek towards the ocean. We covered a couple miles before we reached Los Patos, the first ranger station on the edge of the park. Here we also had a chance to fill up on our water. The rest of the day was a constant mix of small creek crossings, a couple larger river crossings, and stopping for wildlife sightings whenever Arlet, our fantastic guide, spotted something interesting. Some wildlife we encountered throughout the day were butterflies, capuchin monkeys, squirrel monkeys, spider monkeys, poisonous frogs, curaçao, coatis, and even a herd of about a hundred wild boars! The wild boars were my favorite wildlife encounter the entire trip. When we stumbled upon them and startled them, they all stampeded away squealing loudly with their thunderous hooves trampling everything in their path. I'm not sure what I would have done if they happened to be heading in our direction, and the entire experience was quite the adrenaline rush. Some plants we saw were mushrooms, wild flowers, palm trees, cocoa plants, banana trees, my favorite - the walking tree. Arlet was extremely knowledgeable about every species we encountered - she was like a living breathing Wikipedia! This day was tough. Out of the 15 miles we hiked that day, the beginning portion was the hardest as the trail would alternate between climbing up and down, while the later portion was mostly flat. Even though there wasn’t too much rain the day before, the wet leaves and damp ground still made for challenging terrain to hike on, especially on a downhill. We each slipped at least once, and I felt like I had to constantly engage my core to stay balanced and not slip on the wet leaves. By the time we reached La Sirena station, I was pretty beat. Being used to hiking in the dry alpine air, the heat and humidity were definitely a new challenge. The station surprised me with how established and large the place was. Able to sleep up to 100 guests at a time, the station has open-air bunk bed dorms. Each bed has its own mosquito net and basic but clean pillow and sheets. There is even slow wifi here (when it’s not raining), clothing lines to dry your stuff, cold showers, shampoo dispensers, and even ac plugs to charge your cameras and phones. Meals are expensive, but they are pretty much your only option as you aren’t allowed to cook. People started climbing into bed at 7pm, and lights were out at 8PM, so be sure to bring a headlamp to get around in the dark. This would be a great place for hikers to hike in from Carate, stay a night or two, and do day hikes around the station. People started waking up around 4:30am in the dorms, some people heading out for day hikes and some to hike out of Corcovado, but everyone tries to get an early start in hopes of spotting a tapir, a nocturnal mammal that can be spotted in the early mornings. We were actually the last ones to leave around 5:30am! We headed towards the ocean and then turned east to follow the shoreline. We had to hike with a decent pace to make sure to cross a particular portion of the beach at low enough tide. The trail alternates between shaded jungle and exposed soft sand, and I’ve learned that hiking in soft sand is not my favorite, especially with a heavy pack on. At one point Arlet turned around to check on us and spotted a sleeping Bairds Tapir RIGHT BY THE TRAIL. He was so much larger than I expected, and we got to watch him sleep and readjust his position in the mud a couple times. He seemed so calm and undisturbed by our presence. 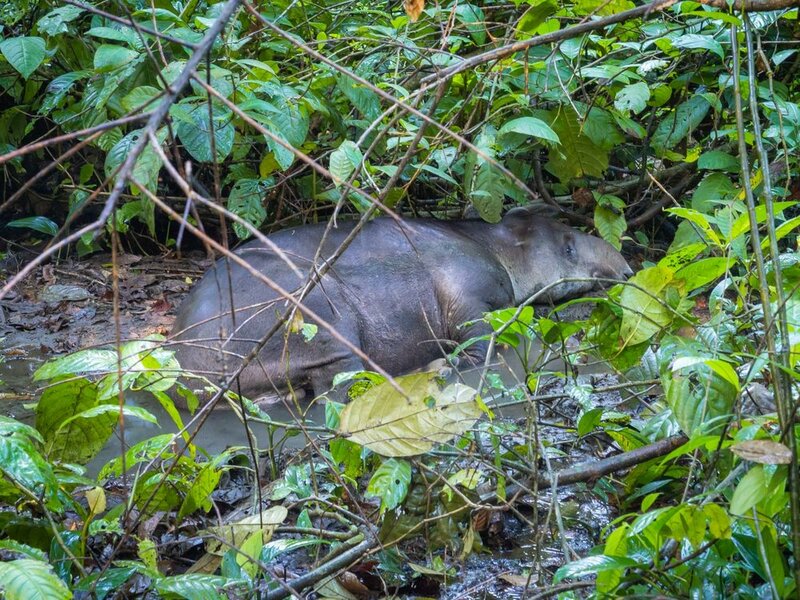 Baird Tapirs are Costa Rica’s largest mammals and are endangered, and Corcovado National Park is the only place you can see them reliably. The last day’s trail was mostly flat, but hiking in the hot and soft sand was no more easier than the slippery jungle floor. However the temperature along the coast was much cooler with the ocean breeze, and the beach views were some of my favorite of the trip. The look of a dense jungle and palm trees overhanging a pristine sandy beach in front of turquoise water is certainly a unique view. Throughout the day we spotted more monkeys, a mother anteater and her baby on her back, vultures, hawks, herons, eagles, whale bones, colorful jungle crabs, and even ocelot tracks on the beach. Eventually we reached La Lleona, the last ranger station we’d pass before exiting the park boundaries. 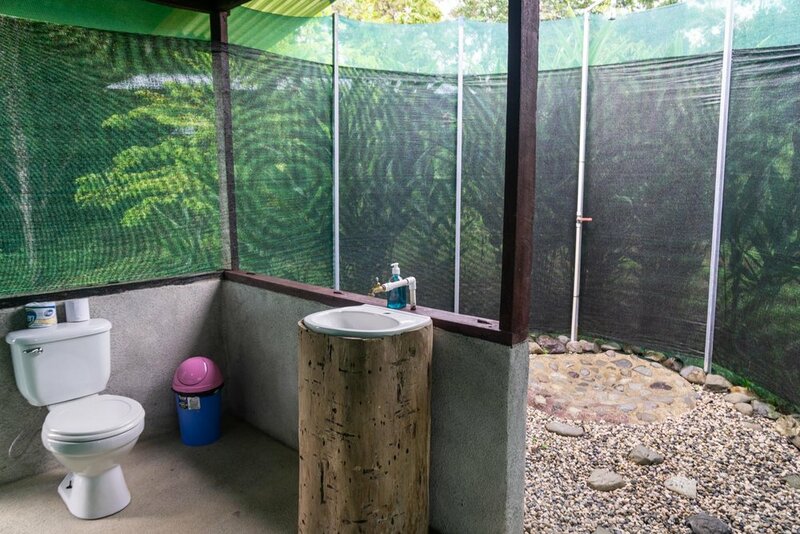 Here they have great bathrooms and outdoor cold showers if you’d like to rinse after your sweaty trek. From here it is only a couple miles either by beach or through the jungle to Carate, where we had a couple fresh coconuts before getting picked up for an hour and a 50 minute drive back to Puerto Jimenez. Our three days in the jungle definitely took me outside of my comfort zone. It was difficult at times, but the frequent wildlife encounters made the miles go by quickly. I still can't believe the amount of biodiversity and wildlife that we got to experience in such a short time and distance. With all the waterfalls, volcanoes, and beaches Costa Rica has to offer, it was initially hard dedicating our entire one week trip just to seeing Corcovado, but looking back, it was definitely worth the time and effort to get there, and I was glad we reserved as much time as possible to seeing the densest and most pristine parts of this truly unique jungle. Disclaimer: This is not a sponsored post, all services and products were purchased with my own money. This post does contain some affiliate links. What this means is I might receive a portion of the sales, at no cost to you. If you choose use them, thank you for your continued support!